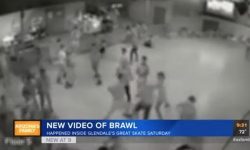 Other top surveillance videos of the week include George Clooney’s scooter crash, earthquake-sensing cats and much more. You can obviously get a DUI while driving a motor vehicle, even a bicycle, but what about riding a horse? 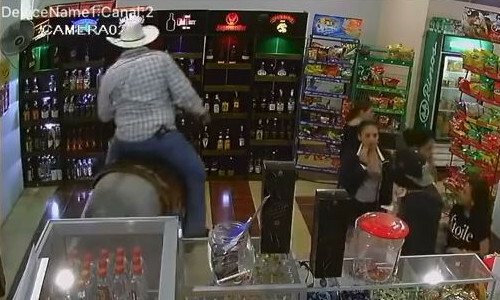 A drunk man was caught on video riding a horse into a liquor store and leaving with a bottle of booze without paying. The video starts with a group of patrons about to leave the store before they suddenly freeze. A man on a horse then rides into the store. Unfortunately, the horse doesn’t have much experience with linoleum floors and slips, sending the drunken cowboy rolling to the floor. 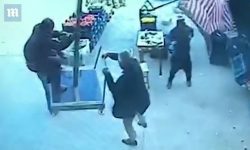 He grabs a bottle and is confronted by the store clerk, who he then shrugs off and then walks out the door. The confused face on the clerk is priceless. George Clooney was in a scooter accident earlier this week while filming a TV series on the Italian island of Sardinia. The incident occurred when a driver failed to obey the right of way and collided with Clooney at an intersection. Surveillance footage shows the actor bounce off the windshield before hitting the ground. Remarkably he suffered no major injuries. 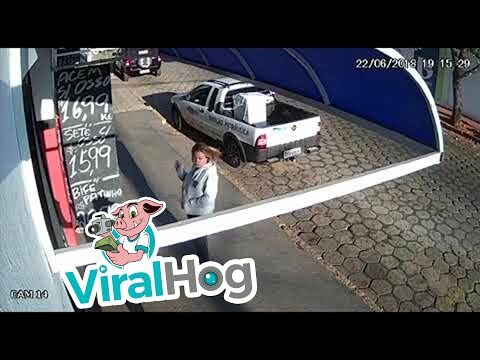 Make sure to check out the rest of this week’s top surveillance videos which include a deplorable woman stealing from an elderly veteran, a wildfire engulfing a cabin and much more!